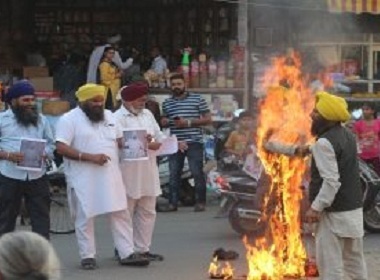 An effigy of Tarn Taran based Kaar Sewa sect head Baba Jagtar Singh was set afire by the Sikh activists in the Bohdi Chowk of Tarn Taran today. The Sikh activists expressed their wrath against the culprits responsible for demolishing the historic Darshani Deodi by shouting slogans against Baba Jagtar Singh and the Badals. Interacting with media on this occasion, Sikh activist Pritpal Singh said that the Kaar Sewa sect headed by Baba Jagtar Singh and the SGPC have committed an unforgivable sin by demolishing the historic Darshani Deodi of Gurdwara Sri Tarn Taran Sahib. “All the culprits indulged in demolishing this historic Darshani Deodi directly or indirectly should be indicted and brought to justice at the earliest,” he added. Meanwhile, the mass support to Karam Singh Bhoian’s peaceful struggle is intensifying day by day. Sikh sangat from distant areas is continuously coming to Tarn Taran to extend support to Karam Singh Bhoian’s struggle. On April 8, the Dhadi jatha of Makhan Singh Musafir (Samalsar) extended support to S. Karam Singh Bhoian by paying a special visit to him.